Home » Photography Tutorials » What is the Second Sunset? In the second of a series of follow-up articles to The Quality of Light, I have posted this article to share a series of photographs (along with the thought processes behind them) that captures the quintessence of a well-known and spectacular light display, often referred to as the ‘Second Sunset’. As with many of my previous articles, my goal with this post is to encourage my fellow photographers to be inspired by light, composition, and mood, to spur them to explore their creative potential, and to get out and make beautiful photographs. One of the many joys of photographing under the light of the Second Sunset is that the light will nearly always be different. Different in terms of the highlights, shadows, colors, mood, cloud patterns, and interpretations. Thus, if the conditions are right the photographer may be in the enviable position to potentially create a unique work of art. It is these considerations and rewards that inspire me as an artist to gravitate to this quality of light. So, what is the Second Sunset? 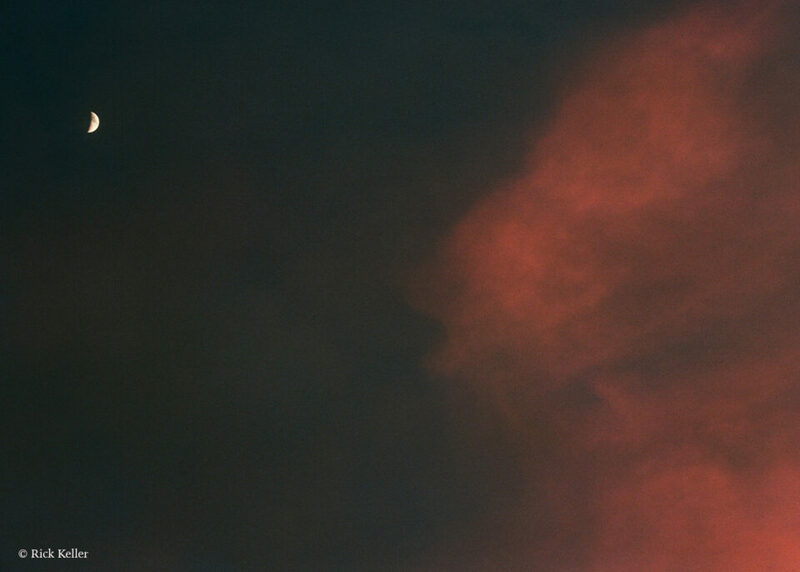 And how does the photographer know if and when it will materialize? 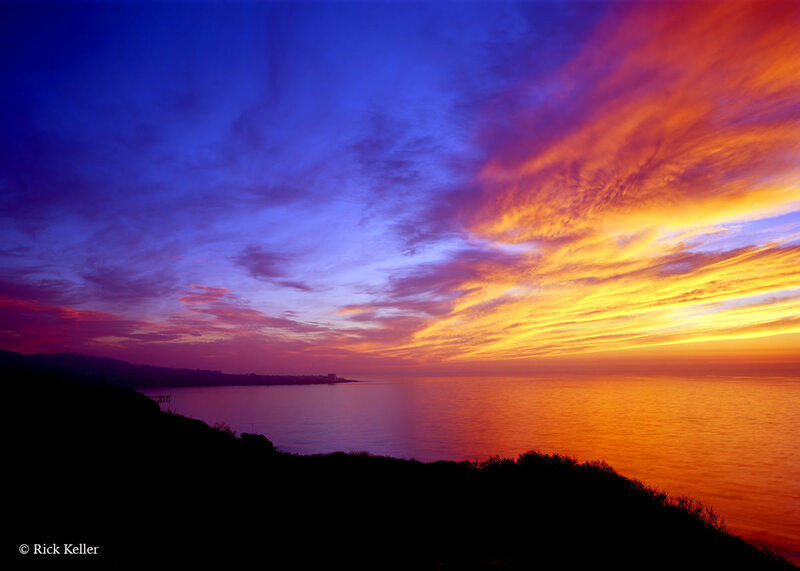 As many photographers, nature lovers, and non-photographers have come to enjoy and appreciate, the Second Sunset is the burst of light that fills the sky and clouds with vibrant and warm colors after the sun sets below the horizon, typically starting around 15 minutes after sunset, sometimes sooner, sometimes a little longer. The vibrant glow of crimson and orange may give way to an equally vibrant magenta mixed with the deep blues of the evening skies at the transition to dusk. However, the Second Sunset may not always materialize, which may disappoint even the most patient of scenic photographers. Trust me, I have gone out in search of this light with high hopes and expectations only to return home empty-handed more times than I care to remember. Whether the Second Sunset will materialize depends on a plethora of factors, including the season of the year, the geographic location, the prevailing cloud cover, and even on the amount of particulate matter in the atmosphere. The physics of sunsets is an interesting and complex topic, but the time-honored principle, Rayleigh scattering, explains how the sky is enriched with warm colors at sunset. Based on my experiences with this light, the prevailing cloud cover has reigned supreme among these factors. Having lived in coastal Southern California for the last several years, I have found that in the early winter months (December and January) the quality of light is more exquisite and the chances of witnessing the Second Sunset are enhanced compared to other seasons, but I have seen exceptions. Although I have not had as many opportunities to photograph the Second Sunset inland, in my humble opinion the quality of light along the West Coast of the US during the winter at sunset is special and something to behold. On the one hand, excessive cloud cover may actually suppress the Second Sunset, especially with dense overcast skies over the horizon. On the other hand, certain patterns of less dense cloud cover may serve as the clue that a special light display will declare itself shortly after sunset. When certain patterns of clouds are present early in the day, the intuitive photographer knows there may be a good chance that Nature will deliver a spectacular light display at sunset. This observation is purely empiric, anecdotal, and difficult to explain, but I hope many of my fellow scenic photographers can identify. Excess water vapor in the sky, as from a recent rainstorm, or particulate matter from pollution in the skies, may confer a higher chance that the Second Sunset may materialize. By its very nature, the quality of light from the Second Sunset will most often be of the backlighting variety with strong highlights, deep shadows, and stark contrast. Depending on how the photographer crafts the composition and makes the exposure, the silhouette effect may be a prominent element of the composition. From an aesthetic standpoint, the quality of this light is well-known to be associated with a burst of vibrant colors, including crimson, orange, gold, pink, and magenta. Depending on the prevailing cloud cover, the light, and the timing of the exposure, the potential exists for making an image that captures the deep blues of the night sky, which may provide a pleasing contrast with the warmer colors. The compositions may range from landscapes to seascapes to the clouds or the light itself. One aspect of seascapes that resonates with many scenic photographers (myself included) is the potential for capturing the reflections of the brilliant colors of the sky from the ocean. Because of the diversity in artistic visions and innumerable possibilities for crafting a composition from this light display, I am delighted to have reached out to our photography community to elicit contributions for this article to share their vision and interpretations of their work on this subject. Getting the timing right is everything. 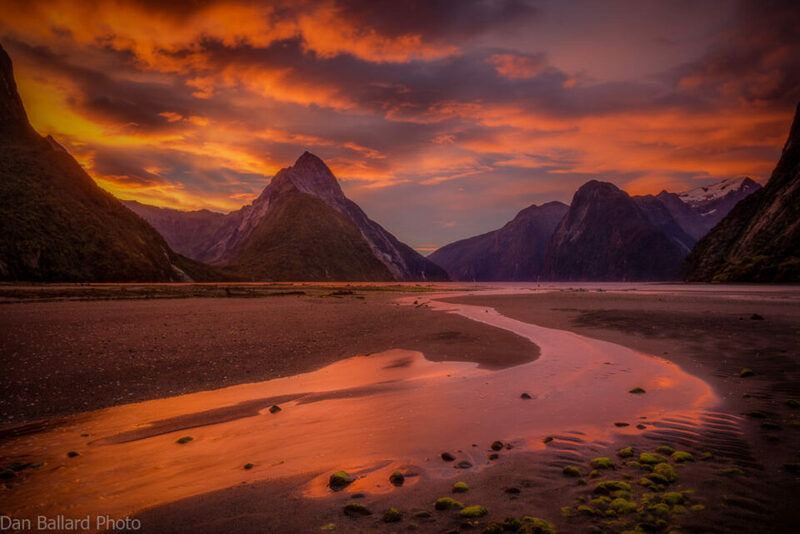 In this case my client and I planned our entire trip to New Zealand around this image. There are only a couple of times each month where the tide is low at both sunrise and sunset. We made sure that we were at Milford during one of those times, and man did we get lucky! Being in the area at low tide gives you countless options in terms of foregrounds, and we spent the day before this image was taken scouting and looking for possible shots. I really tried hard to lead the eye through this image and create balance. I loved the receding tide pulling the eye in and the small green moss-covered rocks balancing out the peak in the distance. I made sure to lag the shutter a bit to get some movement in the water to keep it simple. 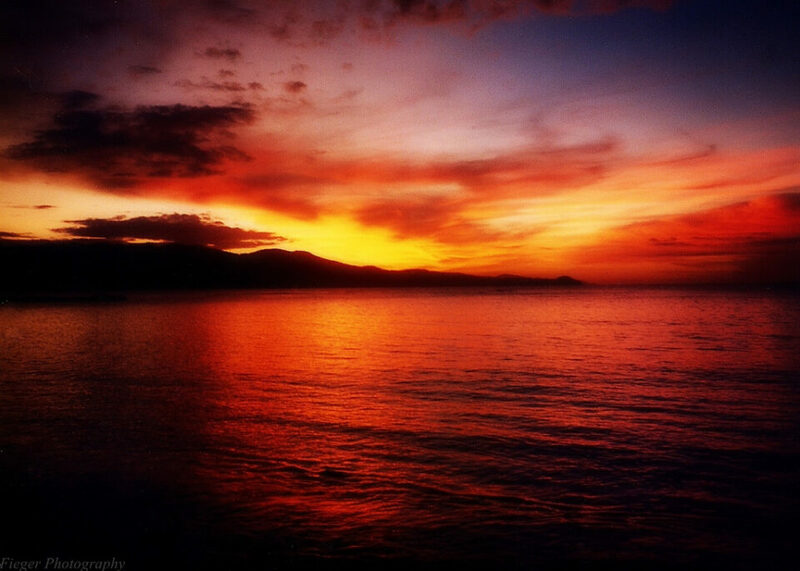 This beautiful and surreal sunset from the talented Ms. Nica Fieger entitled ‘A Jamaican Sunset’, not only captures the vibrant explosion of color in the sky but also its reflections in the water. The ethereal appearance of the clouds and the silhouetted isle convey a beautiful emotion as well as the quintessence of the intersection of light, land, and sea. This photo was taken while standing on a warm sandy beach in Jamaica. This was captured back in 1989 with a simple point and shoot film camera, using a film speed of 400 ASA. 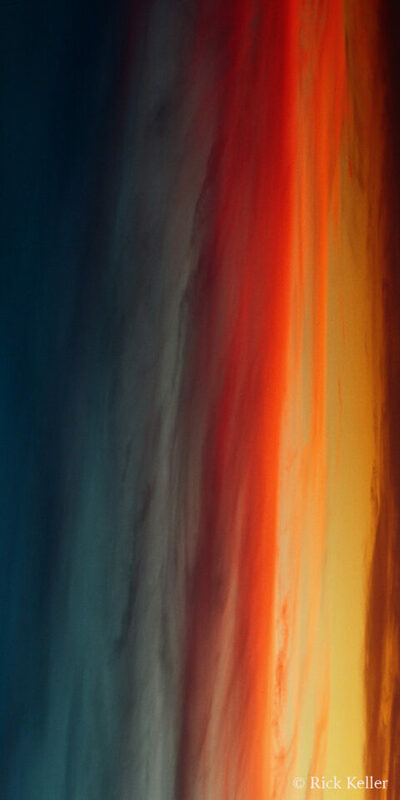 The colors of that evening in the sky would surely captivate one’s curiosity. This sunset opened my eyes to the grandeur of Nature and all her beauty. I can remember the layers of vivid colours, reflecting gloriously off the Jamaican sea water. Soothing and warm yet invigorating, it opened the senses and made you feel alive. 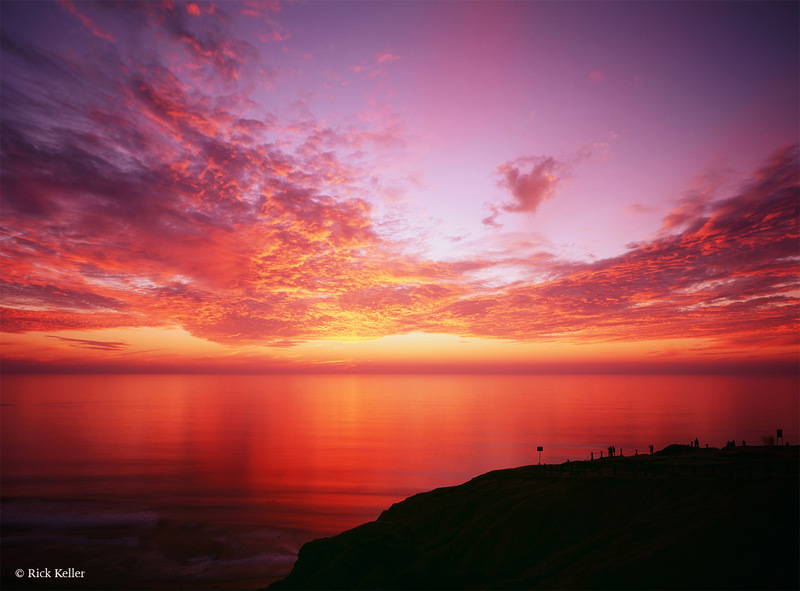 Nasim also wrote an article a few years back on the importance of sticking around after sunset, where he described in detail the circumstances of the second sunset and the resulting high resolution panorama image he was able to obtain. For the aforementioned reasons, much of my personal art work encompassing the Second Sunset revolves around seascapes, mostly during the fall and winter months where (in my humble opinion) the quality and radiance of light at sunset are special. For pictorial effect and style, I enjoy making use of the silhouette effect to create foreground interest and contrast between the deep shadows and the strong highlights. When complex cloud formations are present, I relish their appearance when they ‘catch fire’, creating a surreal appearance and emotion, not unlike that captured in the above images. In particular, I enjoy photographing coastal sunsets because of their uncanny ability to stimulate the senses across the board, as in the visual captivation from the light, the sound of the crashing shore, the smell of brine, and the feel of the cold air. I have found that this sensory experience augments the emotion of the scene and brings me, as a photographer and artist, that much closer to consummating the visualization process. From an aesthetic and technical standpoint, one of the most enjoyable tools that I use to photograph the Second Sunset has been Fujichrome Velvia 50 color slide film, which has been and continues to be a cherished tool for landscape photographers. Beyond the legendary high color saturation, the unique color palette, and high contrast inherent to this film, there is just something special about the true-to-life and emotional experience of viewing vibrant colors on a light table. It is as if you are meeting your first love . . . Consider this next photograph that I had made at breathtaking Torrey Pines State Natural Reserve in San Diego, CA, where I visualized warm colors and strong contrast created by the backlighting and the prominent silhouetted pines in the foreground. The burst of color, the scent of pine, and the distant breaking waves all intersected to create a surreal mood and experience. In addition to using Velvia 50 to capture saturated and vibrant colors, I enjoy making use of strong warming filters, such as the 85C, to lower the color temperature of the light to augment the warmth of the scene. For this next image that I had made in my beloved La Jolla, CA, I was inspired by the exquisite cloud cover and quality of light on a mid-December evening along coastal California. After 10 weeks of nary a cloud in the skies at sunset, a rainstorm had swept through earlier in the week. Judging by the appearance of the cloud cover earlier in the day, I had the intuitive feeling that the conditions were ripe for a magnificent light display at sunset. I had scouted this scene multiple times, envisioning an explosion of color at dusk that permeates the sky and reflects off the water. I visualized a prominent silhouette of the bluff in the foreground along with a silhouette of the La Jolla peninsula in the distance. Nature did not disappoint. The scene was resonant. The cold Pacific air intermittently blew in, chilling my forehead, cheeks, and ears. The crashing of the tide below reverberated in my auricles. The scent of coastal sage permeated the air. Within 15 minutes of sunset, a magnificent display of strong highlights, crimson, golds, pink, magentas, and deep blues of the night sky declared itself. The light burgeoned like a mini supernova in slow motion. The light and colors were astonishing . . .
For those scenic photographers who use film, one need not always use color slide film to capture vivid colors. Here, I chose to use color negative film, Kodak Ektar, which is capable of producing comparably vibrant and saturated colors with a delightful color palette. On another technical note, in order to fulfill my visualization for the scene, I used a ‘color compensating’ magenta filter to accentuate magentas that would have materialized during the spectacular light display. If the light and cloud conditions are aligned, the potential exists for the photographer to create interesting abstract photos whereby light and clouds intersect to create unusual patterns that may captivate the imagination of the viewer. 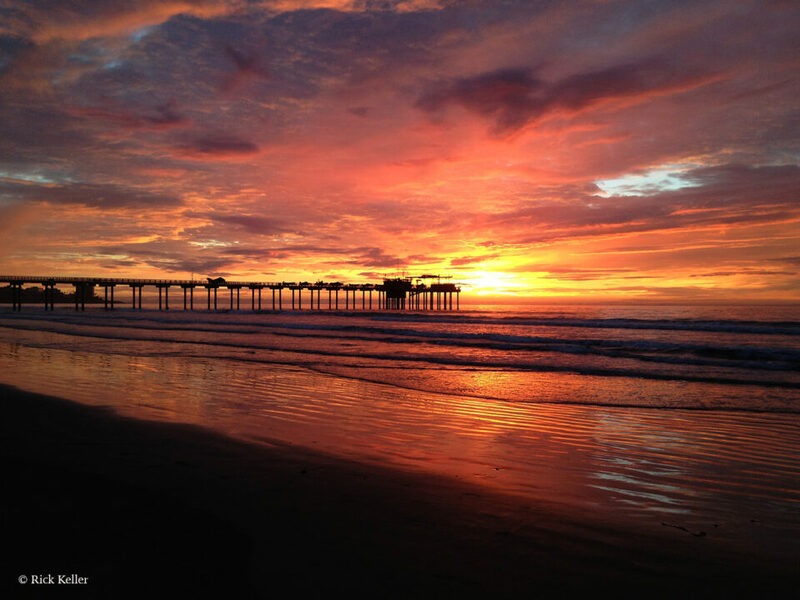 Consider this next image, made along coastal San Diego, CA in the winter. The scene was surreal and reminded me of celestial phenomena, such as a nebula, or perhaps a remnant of a distant and ancient supernova, stretching light-years across . . .
For the following image, with my mood and vision deeply in search of an abstract, I used a long lens to assist me in crafting a composition that would translate my artist vision into reality. On this particular winter evening, long after the sun had melted into the ocean, I studied the light burst at the horizon until I saw that for which I had been searching. Something deeper than light, shadow, or physical color. I saw and felt the juxtaposition of two contrasting worlds and emotions – a firefall and a waterfall coexisting in peace and harmony. It was uncanny. I saw the subtle movement in the clouds and interpreted it as a subtle flow of fire and water in distinct columns, and with that I felt a flow of emotion . . . At the decisive moment the shutter was opened and the light and the emotion gave way to the artist’s rendition. Finally, while the photographer may be obsessed with the glory that may be unfolding in front of the lens at the Second Sunset, it would be wise to occasionally look behind you, as another beautiful light display and composition may be evolving . . . The light of the Second Sunset represents a special quality of light that has been cherished by photographers and visual artists alike to create beautiful works of art. If the weather conditions are right, the vibrant colors and the strong backlighting can be manipulated in the visualization process to bring the viewer into the world as you saw and felt it. With unlimited variations of the intersections of light, sky, sea, and land, the potential for creating dramatic and unique images that capture your vision is also unlimited. Of course, there is no guarantee that Nature will deliver the goods on this quality of light; but if the physical elements, the artistic vision, and the emotion are aligned in harmony, then your patience and determination will eventually reward you. So, my fellow artists and photographers, why don’t you stay out a little longer at sunset? Be patient. Don’t worry about being late for dinner. And keep going out! The light of the Second Sunset is out there waiting for you. Do you also have a passion for and are inspired by the light and emotion of the Second Sunset? If so, please leave your thoughts on your experiences below in the comments section. Do you have images that capture your personal rendition and interpretation of this light? If so, we would love to see your work posted in our Photography Life Landscape Forum. Special thanks to Dan Ballard, Talha Najeeb, and Nica Fieger for their beautiful contributions to this article. And once again, special thanks to Northcoast Photographic Services for the film development services for my contributions. Great job, Bonnie & Scott! All of these photographs are copyright protected. All rights reserved. You may not copy, download, save, or reproduce these images without the expressed written consent of the contributors. Stop reading after see the word iphone under the first photo. Chris, and why is that? I stopped reading after F6 + 70-200 f/4 because I went looking up how much Kodak Portra 400 is going for these days. I haven’t shot film in six years! I know … iphone doesn’t have a full frame sensor! On a different note: Thank you Rick for the wonderful article! Rick nicely done. A good photographer can use any type of camera and achieve excellent results, from an iphone to 4×5’s. .
Hi Chris, thanks for your comment. Well said! I had been anticipating this post but now that it’s up, I must confess, I am blown away by the quality of work you’ve shared here. There are some truly stunning images, particularly the last two. There is a depth and balance to them that really draws the viewer in. Recently I’ve been lacking the motivation to go out and shoot the sunset sky – this has inspired me to seek out simpler, unconventional compositions. Thank you and look forward to seeing more of your brilliant work featured here. If there is second sunset, there is then i suppose second sunrise too, since second sunset conditions can happen before sunrise too. Should have added that second sunrise should be in “” markings… “second sunrise” is more troublesome to take a photo of because you need to wake up very early or not to go sleep at all. It is easier to shoot second sunset and i happen to have a job in a sweet spot. Every summer after second shift of my workday, at 10:40pm (UTC+3) i get a nice view on a road to home. All those 15 minutes i ride home, sun sets right on top of my home road. Just when i get home, its second sunset time. The climate here in Estonia is just about right to see second sunset quite often. It just happens so that during spring and autumn, before first work shift, you can see “second sunrise” too. Few weeks ago i took this partial second sunset. There was too much other distraction so i took something different on a shot. Thanks for your inspiring article. In the south, about 200+ from the east coast I seldom see inspiring sunsets–but that doesn’t keep me from watching. I’ve been consulting sunsetwx.com daily for predictions and for our area accuweather’s visible radar. It shows me a loop of the clouds as then move through the area www.accuweather.com/en/us…vis?play=1). 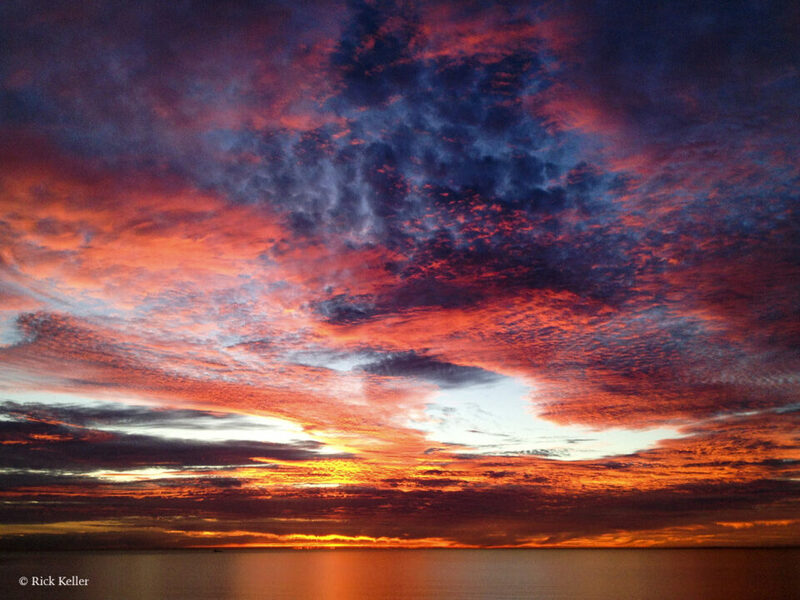 Your article has further bolstered my resolve to capture an epic sunset. I’ve shot a few lovely sunsets over the years. Very often when I see color that I now learn is a second sunset, I am at home with no time to get to a good location, so I shoot right over the trees in my front yard. 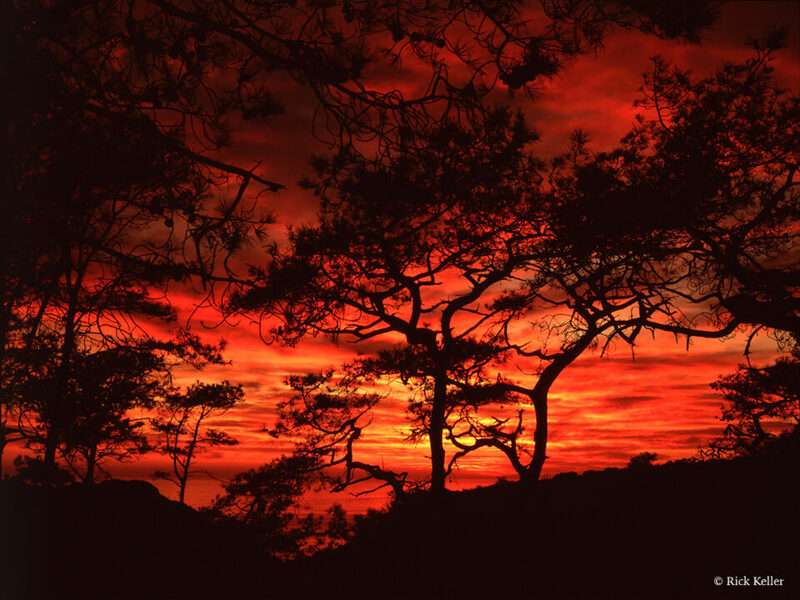 The result is very similar to your photo of tree silhouettes against the fiery red light. The day after I read this article I was inspired to go to my local beach here on Long Island and go for a more spectacular sunset again. Well somewhat ironically, that day there was a giant cloud structure (which was in itself interesting) that blocked the sun entirely. So there was no sunset at all, photographically speaking. 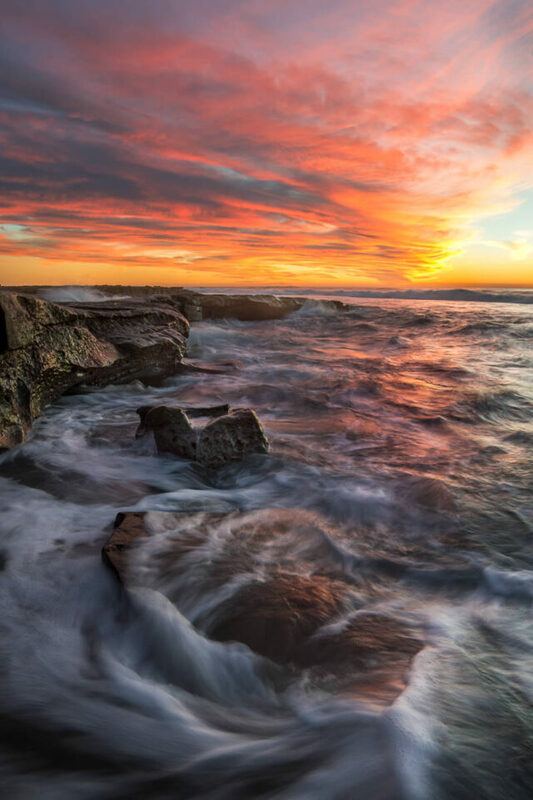 This confirms that perseverance is one of the key factors in capturing these beautiful sunsets. But now that I have got the bug, I will keep showing up to try to capture the magic. Thank you, Rick, for inspiring me. Well, if you are interested there are three samples of my best sunsets on my website. Go to www.elainesphotography.com and look in the gallery named ‘Favorite Photos’ about halfway in. Each of those sunset pictures is part of a set that I have here on my home computer. I think they’re not bad. I hope to capture better ones in the future after reading your delightful article. Again, thank you for the inspiration. Wow, Elaine . . . 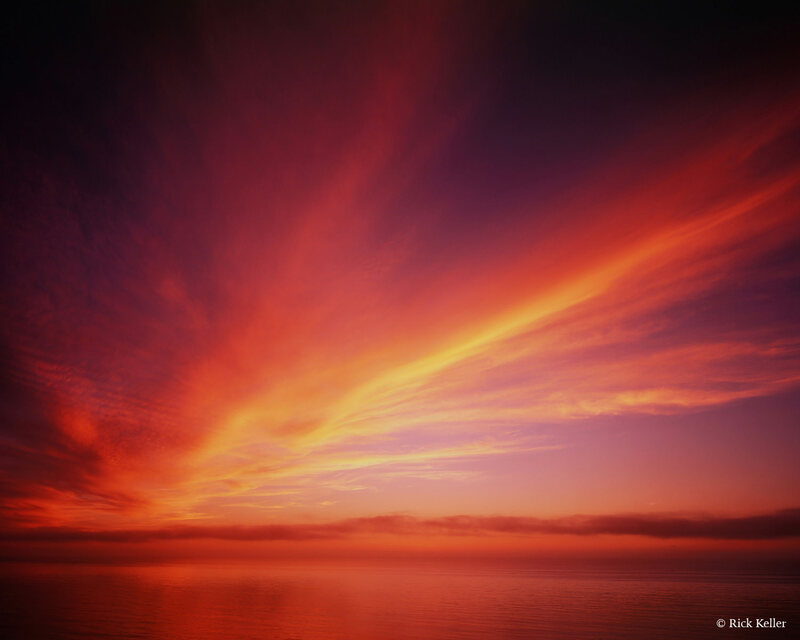 Your image, entitled ‘Fiery Sunset’, is gorgeous! The prominent silhouetted trees, crimson, pinks, and magentas are beautiful. I like that your rendition features a pair of trees conveyed with simplicity, which I interpret as an emotion of love — between a man and woman, husband and wife — and as another day in the life. Well done! I must say that your gallery is filled with many beautiful photographs, in particular your images of flowers. You’re a very talented photographer, Elaine. Thank you for sharing! Thank you so much, Rick. Your accolade means a lot to me. I’ve never had a pro photographer even review my work, let alone react so positively. I’m glad you enjoyed looking at my gallery. Flowers are a specialty of mine, along with birds and landscapes. I look forward to seeing more of your work and learning from you and the whole team here at PL in many future essays to come. Thank you again. Wonderful article and breathtaking images that should inspire many photographers. The iPhone shots prove it’s not the tool; it’s the photographer. The sky is, indeed, the greatest show off earth, and it is constantly changing. I got turned on to the grandeur of the daytime sky 35 years ago and started photographing it roughly 15 years ago. There are no marketing hooks — just click where it says DOWNLOAD in red. Below that you’ll find a link to a YouTube video that combines my sky shots with soothing music. A friend says he watches it whenever he is having a rough day. Anyway, thanks for an excellent and inspiring article. Rick, well done. Yours and your contributors’ images are stunning and inspirational. Clouds need to be right above where the sun will set, so that the sun illuminates the clouds from underneath as it is setting. A meteorologist told me: if the weather forecast for the next day is a sudden drop in temperature and thunders, then there is a good chance that the sunset on the previous day will have gorgeous pinks and reds. And it’s true! Amazing. I have seen it only in the warm seasons in the Mediterranean. P.s. There is a place in the center of my city where couples gather every sunset to observe it, it has lots of reds. The sun sets over buildings that are nearby, they are not photogenic unfortunately, but does this show that there are places inside of cities where the conditions are right?